Environmental Management | Toyoda Gosei Co., Ltd. While working for environmental preservation, we are continuing employee training and education programs so that every employee can act with a wareness of the environment. Toyoda Gosei will do its utmost to raise the environmental awareness of employees and train personnel for sustainable environmental activities. 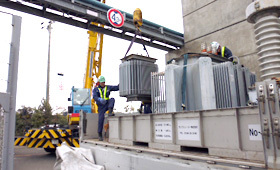 The entire Toyoda Gosei Group is carrying out environmental management. We began collecting environmental data from domestic affiliates in 2001 and overseas affiliates in 2003. Targets are set each year based on these environmental data (CO2 emissions, waste volume, water usage, VOC emissions and more) as we work to reduce them. In FY2017 we worked in close collaboration with each Group company to achieve these targets. TG East Japan Co., Ltd.
Toyoda Gosei Automotive Sealing Mexico S.A. de C.V.
Toyoda Gosei Haiphong Co., Ltd.
Toyoda Gosei South India Pvt. Ltd.
Tianjin Toyoda Gosei Co., Ltd.
Toyoda Gosei Star Light (Tianjin) Auto Parts Co., Ltd.
Toyoda Gosei (Zhangjiagang) Co., Ltd.
Toyoda Gosei (Foshan) Rubber Parts Co., Ltd.
Toyoda Gosei (Foshan) Auto Parts Co., Ltd.
Toyoda Gosei (Tianjin) Precise Plastic Co., Ltd. Internationally, we established environmental management operations in China in 2010, the rest of Asia in 2014, and the Americas in 2015, and have since been strengthening these systems. 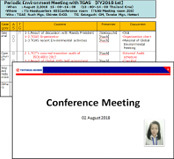 In FY2017 we held teleconferences with regional headquarters to share information and strengthen cooperation while raising the level of environmental management and revising the TG Global EMS (Environmental Management System)* for the prevention of environmental mishaps. * Toyoda Gosei’s manual defining the company’s mechanisms, including specific management methods and procedures, centered on compliance and environmental impact reduction and including the aspect of risk management. We have completely revised the TG Global EMS, which was first formulated in FY2006, and expanded it to domestic and international affiliates. The revisions aim to clarify the roles of TG World Headquarters and regional headquarters, where ambiguities had begun appearing with the increase in locations. The revisions also established reference values for trend management, where inadequacies had been seen, and adopted more detailed content with input from various locations for prevention efforts including key points in the management of performance indices. Audit of whether environmental management systems are operating properly. Toyoda Gosei and our domestic and international affiliates have acquired ISO 14001 certification for our environmental management systems. We have also completed a transition to ISO 14001:2015. Internal environmental audits are done by teams composed of members from outside the workplace being audited to raise the independence and objectivity of the audit. 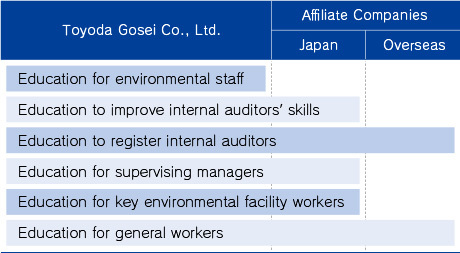 Toyoda Gosei Co., Ltd. also requests external environmental audits from the Japan Quality Assurance Organization (JQA), and our environmental management system conforms with ISO14001 to ensure proper operations. Internal environmental audits/Ogawa Ind. Co., Ltd.
From FY2017 to FY2018 we conducted voluntary inspections based on the TG Global EMS. 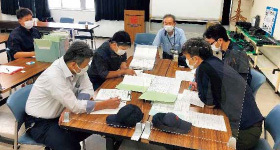 Toyoda Gosei also conducted on-site environmental audits of actual operations at key locations. Corrective measures have been completed for all of the points for improvement identified in these audits. Regular checks are conducted by expert departments and maintenance and management are carried out to ensure not only legal compliance but also that no environmental problems or complaints occur. 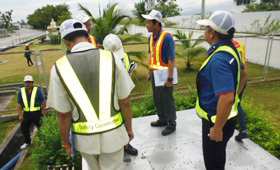 Preventive activities such as environmental preservation walks are also conducted to combat risks. In addition, we analyze problems that occur at other companies, inspect similar facilities including those at domestic and international affiliates, and take preventive measures. 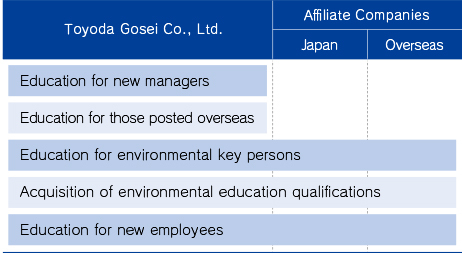 In FY2017 we had five environmental mishaps (Toyoda Gosei Co., Ltd. 1, domestic affiliates 0, international affiliates 4). In all five cases corrective measures were implemented and preventive measures were deployed throughout the Group. Law mandates that toxic and persistent polychlorinated biphenyls (PCBs) must be treated by March 2027. Toyoda Gosei Co., Ltd. began outsourcing this treatment in FY2006, and by FY2017 PCB waste from 848 devices had been treated. In FY2017, 13.8 tons of low concentration PCB waste from 14 transformers, condensers and other devices was treated. We will continue efforts for the early treatment of currently untreated low concentration PCB waste. We carefully monitor and treat soil and groundwater contamination from toxic substances such as trichloroethylene, which was formerly used in cleaning agents. We have established observation wells at each plant, and regularly confirm that there is no soil or groundwater pollution from toxic substances and oils. Toyoda Gosei educates employees on environmental problems including the destruction of nature and environmental pollution, the impacts on the environment of production activities, and compliance with environmental regulations. The content each year emphasizes understanding and practices based on legal trends, with examples incorporated to create specific and understandable teaching materials. We focus on reducing environmental impacts and sharing best practices through the TG Global EMS and monthly reports, while providing training to raise environmental skill levels in order to increase knowledge related to environmental management work. 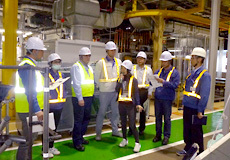 In May 2018 we shared medium-term CO2 reduction targets and provided training to raise the environmental skill levels of environmental managers in two key locations, Toyoda Gosei (Shanghai) Investment Co., Ltd. (China) and Toyoda Gosei North America Corp. (USA). We will continue environmental educational centered on employees at key environmental locations. Environment Month and environmental forums are held regularly to raise the environmental awareness of employees and promote continuous implementation of environmental protection activities so that every employee can act with awareness of the environment. We have begun conducting annual surveys of all employees to gain an understanding their environmental awareness. We will then develop educational activities based on the results. Environmental exhibits are held with the aim of encouraging environmental protection activities. In FY2017, the exhibit consisted of videos and panels introducing best practices from domestic and international locations. 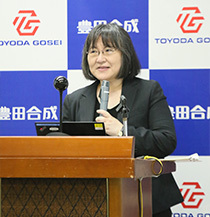 Topics included the development of manufacturing technology and plant improvements for compact, energy-saving production equipment and lines, waste and water reductions, the need for nature-friendly activities, Toyoda Gosei Group activities, and an image of where the company wants to be in FY2030. 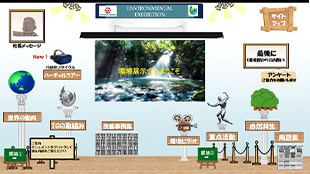 A “traveling environmental exhibit” with the same videos and panels was held at later dates at four plants that requested it (Morimachi Plant, Kitakyushu Plant, Fukuoka Plant, Bisai Plant). 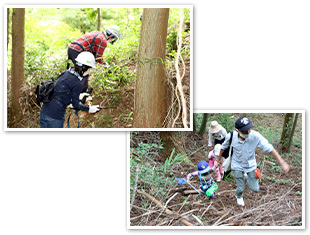 Eco Tours are held for employees and their families to learn about the environment. In FY2017, as an opportunity for employees and their families to think about the environment from a nearby location and directly experiencing nature, we visited the Gas Energy Hall of Toho Gas Co., Ltd. to learn about the environment and energy, and observed living creatures inhabiting a neighboring biotope. To raise environmental awareness, we invited TG Group employees to submit senryu verses on the themes of energy savings, water savings, and eco activities such as sorting trash and recycling. Five people received excellence awards from among the representative works chosen in each department or company. The submitted verses were also posted on the company’s internal website to raise environmental awareness. Environmental forums are held with the aims of raising environmental awareness and promoting environmental activities. 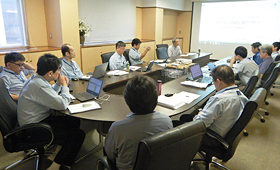 In FY2017, Takenori Takahashi of Konica Minolta, a company known for its superior environmental management in manufacturing, was invited as the lecturer. He shared a variety of best practices in the areas of green products, green factories, and green marketing to reduce environmental impact over the entire product lifecycle while contributing to CO2 reductions in society overall. 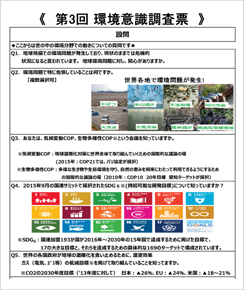 Toyoda Gosei Co., Ltd. conducted its second environmental awareness survey of all employees in Japan to assess environmental trends, the level of employees’ awareness of company environmental activities, and whether the efforts in FY2017 were understood and effective. 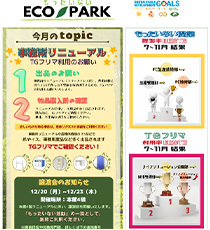 As in the previous survey, employees showed high interest in world environmental problems. Their recognition of the company’s environmental activities was higher than in the previous year but still insufficient, and their environmental awareness tended not to be tied to practice. Based on the survey results, we will implement measures that will lead to concrete environmental activities. Toyoda Gosei established an “Environmental Contribution Award” system to raise environmental awareness and promote environmental activities. Prizes are awarded for the most significant results achieved in environmental activities in the categories of manufacturing, engineering/production preparation, and plants/offices at Toyoda Gosei Co., Ltd., and by domestic affiliates. In FY2017, the award for the manufacturing category was given to the SS Manufacturing Division, which actively invested in equipment and achieved great progress toward environmental impact reduction targets. The award for the engineering and production preparations category was given to the SS Production Engineering Division for establishing an effective and innovative test method for reducing CO2 emissions in mass production processes. The award for the plant/office category was given to the Heiwacho Plant for active environmental awareness educational activities, such as environmental education in elementary schools and creating green curtains. For domestic affiliates, awards were given to Ichiei Kogyo Co., Ltd. for significant progress toward all environmental impact reduction targets, and Hoshin Gosei Co., Ltd. for strong efforts and big results in reducing CO2. Note: The awards were for activities conducted during the period of April 2016 to March 2017. Together with Environment Month in June 2017, we invited submissions for a new environmental symbol from all domestic and international Group companies with the aim of raising environmental awareness. Three hundred fifty-three entries from around the world were received, and one was selected following a review from the perspectives of ease of understanding, approachability, and use applications. It will be used as a symbol of our environmental activities on business cards and in events and other occasions to increase interest in the environment. 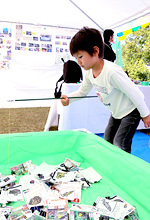 An environmental booth to introduce environmental activities is set up at various company events to encourage understanding of the importance of environmental activities. The theme in FY2017 was coexistence of humans and nature, and at the TG Festival panels showing the importance of nature-friendly activities and the kinds of activities conducted by Toyoda Gosei (plant afforestation, biotopes, All Toyota Green Wave Project, others) were displayed. An event using origami was also held for people to learn about familiar insects in daily life. 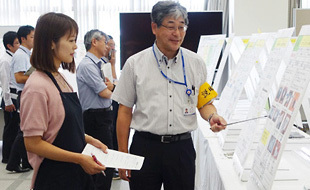 Participants were also shown that the festival itself was environmentally-friendly, with the CO2 emitted at the festival offset by increased CO2 absorption from a Toyoda Gosei Group company’s efforts to preserve a prefectural forest in Iwate Prefecture. Many employees, their families and community residents came and enjoyed the TG Festival, taking advantage of the opportunity to think and learn about living with nature. 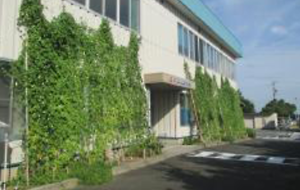 Toyoda Gosei has been growing green curtains of goya and cucumber plants to cover the south sides of buildings since 2012, with the aim of raising employees’ environmental awareness and reducing summertime energy usage. A “Green Curtain Contest” for the best green curtain was held again in FY2017. Fourteen locations of 9 companies entered the contest in the “Office” category and 18 people entered in the “Individual” category. 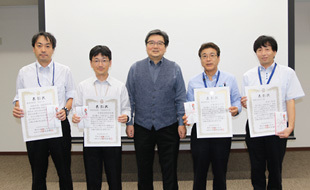 Three offices in Japan, one overseas, and three individuals received awards. Office category: Hinode Gomu Kogyo Co., Ltd.